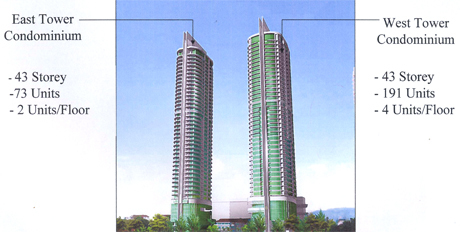 Penang Gurney Paragon - This freehold land, measuring 10.21 acres, being the latest addition to Hunza Properties Berhad's landbank is strategically located in one of the most prestigious and established addresses along Penang's renowned promenade - the Gurney Drive. It has the frontages of both Gurney Drive and Jalan Kelawai. The proposed integrated development in this famous tourist attraction landmark comprises 2 blocks of high-end condominiums and a shopping mall of more than 1 million sq ft retail space which will be built around the St Joseph's Novitiate, a heritage masterpiece. St Joseph's Novitiate is under proposal to transform to its original outlook and shall house boutique retailers and restaurants. Located within the "most happening" stretch of prime estate in Penang, one can easily access to myriad of amenities such as business & commercial complexes, shopping havens, fine dining, restaurants, hawker centres, 5 stars hotels, financial institutions, medical centres, college, schools, markets and popular leisure hangouts etc. - all the while fanned by cool breezes coming in from the calm seas of the straits channel. Built Up area : approx. 4,574sq.ft. – 4,629sq.ft. Smart Home : Home system components, Broadband internet connection, Multiple Astro Connection points. Built Up area : approx. 2,810sq.ft. – 3,254sq.ft.